March 11th marks the 6th anniversary of the Great East Japan Earthquake. Mr. Bradley Lobue, an American living in Japan published an e-book chronicling his experiences not only on that day, but also in the subsequent weeks and months. The book is a detailed account of his experiences with the earthquake and the nuclear crisis. It gives details about the event from his perspective. The effects of March 11, 2011 still linger for those of us who remain in Fukushima prefecture. The road to recovery has not been easy and will take more time before many people can reclaim the lives they had before that horrific event. Thankfully, we have seen signs of life breathing back into Koriyama over the past few years. Radiation levels have drastically dropped to manageable limits in general, although Koriyama still suffers from “hotspots” (where radiation levels are still well above the norm) in various neighborhoods and locations. Damaged houses and buildings are being razed and rebuilt. New roads have been constructed and businesses are returning to the area. Koriyama is boldly rising from the ashes. I have written an e-book about that fateful day, as well as the weeks and months following, from my perspective; a foreigner living in Fukushima prefecture. 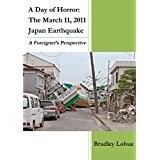 It’s titled A Day of Horror: The March 11, 2011 Japan Earthquake-A Foreigner’s Perspective. The book is for sale on Amazon in countries where available. I hope that you enjoy the book. Thank you for your kind support and consideration.